"The accurate way to measure bearing clearances"
With a wide range of uses in industrial and commercial applications Plastigauge is particularly effective for the measurement of separation in moulding tools, and wherever it is required to determine the separation between hidden surfaces. 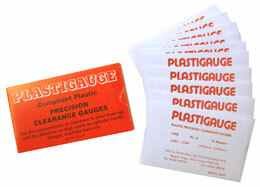 Genuine Plastigauge Plastic Precision Clearance Gauges are the original and most accurate Plastic Clearance Gauges available today. Plastigauge is formulated and manufactured to the highest specifications to guarantee better accuracy- accept no substitute. Also available as a Retail Pack of 10 Gauges- see Order Online for more! Pay with your major credit card securely online. ©PlastigaugeUSA /JHPS™, Paso Robles, California.